Howecerm I m struggling with how to draw the curved lines to connect all the points I need, all i have been able to produce is a nozzle using straight lines. Ideally I would like to be able to define the curve angle and length which I can then produce a mesh in the shape. Iif someone can suggest a better package please do. pdeModeler is for 2-D problems, so I assume that you have 2-D geometry. In this case, you can use a parametrized function for 2-D geometry creation. 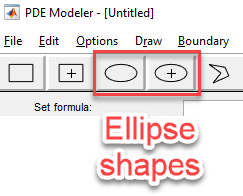 You can also use CSG modeling in the pdeModeler app, using an ellipse as one element.